We enjoyed 10 days at Le Banquet and had a lovely relaxing time It's so pretty and the house was great. Our two year old loved the pool and the huge games room which was full of toys, books, puzzles etc to keep her busy. Thank you Rob and Karen for having us and hope to visit again! thank you so much for your kind words Suzanne, we are so glad that you enjoyed your stay at Le Banquet and we really hope that we will see you all again someday! We loved our stay at Le Banquet! Stayed for 1 week in late June and it was beautiful. The gardens were stunning and we loved the pretty river, view from our back door (fields and cows) and the layout of La Fermette! Very clean and well maintained, better than the photos show it. Perfectly equipped, Karen and Rob had thought of everything - plus they were the perfect owners, friendly and welcoming but totally left us to it. Oh and the games barn was wonderful for us all to play it. Brilliant! All in all it was the perfect French experience for us, highly recommended. Exactly what we dreamed of. Karen and Rob were the perfect hosts; there whenever we had questions and very welcoming yet we felt we had the property to ourselves, even with other guests booked. 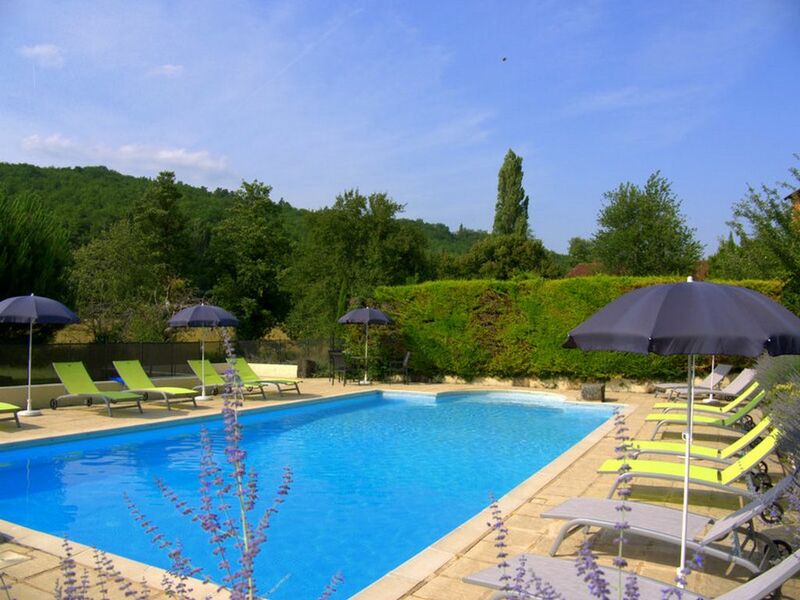 It feels tucked away but it is only minutes from a quaint town and close to all the best attractions of the perigord noir. cest bon! We arrived at the end of a very hot summer to stay in La Fermette for 10 days. We were warmly welcomed by Karen and Rob on our arrival and given a tour of the property and it's grounds. Everything was as described and very much to our satisfaction. The position of La Fermette next to Karen and Rob's farmhouse was very picturesque with lovely flowers and herbs surrounding the property and sitting on the banks of the small stream running past the terrace. Inside the property was very nicely furnished with everything you could need. If something wasn't there or was broken, only a mention to Karen or Rob and it would be dealt with tout suite. The situation of the property was perfect for exploring the area of the Perigord Noir with most places of interest within an hour of driving. Karen and Rob recommended places to visit, eat and things to do when asked - they do have a barn full with lots of information on the area although you can't beat it straight from the horse's mouth. Three of my favourite things were the canoeing down The Dordogne, lunch at Le Dejeuner sur l'Herbe in Saint Leon sur Vezere and dinners at Mentalo in Les Eyzies which were excellent and very reasonably priced - don't be put off by the Pizzeria sign as it doesn't serve just pizzas - the fillet steaks were superb! All in all I can't rate the property and the area highly enough. You won't be disappointed. We had a wonderful holiday at Le Banquet. Our gite was spacious, comfortable and clean. The gardens and grounds are beautiful. Our children loved the pool and all the games and toys available in the playbarn. Our prices include, use of all facilities, all bed linen & towels, tourist taxes, end of stay cleaning, all baby equipment, welcome bottle of wine etc. For a full list of facilities you can visit our website at www.lebanquet.com We accept payment by cheque, bank transfer or you can pay by credit card via the Homeaway website but this will incur an extra charges.